Luxurious Kimono Wrap Style Robe. 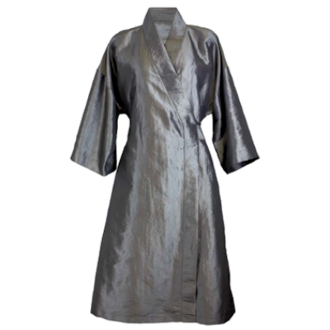 This DS DuraLuxe (TM) Platinum robe style is designed in gorgeous Faux Silk material in Platinum color. This professional material is long lasting and durable with a beautiful soft shimmer effect. Refined and glamorous, this luxurious robe pampers and protects your client . Easy care, machine wash. Adjustable kimono wrap style fits most. OSFM.